How Blizzard's RTS came to be. Retro Gamer is an award-winning monthly magazine dedicated to classic games, with in-depth features from across gaming history. You can subscribe in print or digital no matter where you are by clicking this link. This month's issue features Chaos Engine on the cover, and it's out now. Every couple of weeks, we feature PC-focused articles from across Retro Gamer's long history. This making of StarCraft was originally published in RG170, released in July 2017 (hence the discussion of StarCraft Remastered at the end), and is republished here with the editorial team's permission. No one could deny the impact that StarCraft had on the games industry. Whether you found yourself Zerg-rushing other players online or playing it years later after the fact, or never even so much as looked at a screenshot, you know this game. StarCraft has become synonymous with RTS games and, at a time when developers were still trying to figure out exactly what could be done with the genre, it was a galvanising title that crystallised much of what we've come to expect from RTS games. In the mid-'90s, this was an up-and-coming company making a name for itself: Warcraft had been released, its more-important sequel was due to hit the shelves, and even Diablo was on the way. But Blizzard was still a small company then, working on a budget just so it could keep its doors open. It didn't have the resources it has today and it sure as hell wasn't intending for StarCraft to be the game to change all that. “Well, we had just finished work on Warcraft II,” remembers Patrick Wyatt, one of the key programmers on StarCraft, “it was a product that ran late. And immediately afterwards there was a desire to continue the franchise and to find ways to pay for all of the salaries of the people who were still working.” Patrick alludes to the vast difference between the industry then and the industry now, suggesting that the numbers of sales was often so much smaller than they are today, and it was tougher to get by. “So there was a desire to get back to the next project,” he adds. “And so the idea was that some people were going to go off and start another project and then some of the people who were not the leads on Warcraft II were gonna become leads on StarCraft. StarCraft was envisioned as a sort of an expansion set, and this is how we described it internally… except it was going to be a standalone expansion set. So it wouldn't reinvent everything, and it would be done in 12 months.” This was 1995, with a planned release of 1996; a date the game would not hit. The game's sci-fi theme was intended from the start, says Patrick, explaining that having already covered fantasy with two releases of Warcraft it was now the time for something different. With Command & Conquer having found huge success with its modern military setting, it was clear there was one option for Blizzard from the start—and so initially ‘Orcs in space' was the driving goal for the game. “It was sort of like re-envisioning what would happen if the world of Warcraft just went into space,” Patrick says, “and so the perspective was the same, the art style was a bit different.” Gone was the natural greens and browns of fantasy-fuelled Warcraft, instead here Blizzard opted for something more space-like—a horrific blend of putrid pinks, bright blues and garish greens. It stood out, for sure, but not in a good way. Blizzard found itself the victim of trade show disaster as the team attended E3 1996 to discover that no one was a fan of what would be the company's next game. The art style as of E3 1996. Yet while this faked E3 presence from Dominion Storm may have fooled even reputable game developers, it was a catalyst that ultimately led to a renewed vigour for the StarCraft project. What was once intended as a quick title intended to fill a gap in Blizzard's release schedule turned into a much bigger deal. It was during this time that Bob Fitch had in fact rewritten the entire game engine. Utilising the time where so few developers were working on StarCraft meant that he was afforded the opportunity to recreate everything, to create a engine that could introduce all the features that they couldn't with the old, 2D Warcraft engine. “It made creating the artwork harder, it made pathfinding and AI, in particular, much harder because when you have a diagonal line that's decomposed to these squares, everything becomes kind of jaggy. The pathfinding, as evidenced by the way the Dragoons work, was just a big problem.” Despite the workaround, it was enough to give the StarCraft team the opportunity to turn the game around, to make something special. The “Orcs in space” concept was ditched and Chris Metzen—one of the most important figures for all of Blizzard's fictional universes—came in to create something that was compelling. This meant three different factions to play as, each playing very distinctly from one another. “Suddenly, when we looked back at Warcraft II, one of the things that was clear after the fact was that the sides were very much a chess piece-like balance, where they're very much interlocking with each other. And it's well balanced but primarily because the units are very similar to one another across both sides,” Patrick says. And that was true of most RTS games at the time. With the core elements of the game set, development would roll on for almost a year more, releasing in March of 1998 after much of the team had worked extremely long crunch hours throughout its duration; it was, after all, intended to have been released by 1996. Blizzard—staying true to the developer's approach as much then as it does now—knew it was better to delay a great game than release an unfinished one. This meant there was always room for improvements and innovation, and with the rise of CGI it was clear that Blizzard wanted to be at the forefront of this new approach to storytelling if it was to truly present something that felt believable. That devotion ultimately paid off. StarCraft was released to immediate success, selling a huge 1.5 million in its first year before going on to achieve 9.5 million copies sold worldwide. Critics praised the title, suggesting it was the standard by which all RTS games will be measured. Today, the concept of a ‘Zerg-rush' is still well known and referenced, while design elements of the game are still prevalent through practically every RTS game since. 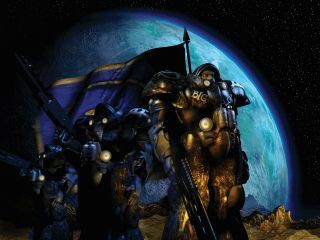 But more than anything, StarCraft is a game that even now has an active player base, a facet helped along by its multiplayer mode that had helped to boost the game's popularity as much in the US and Europe as it did, unexpectedly, in South Korea—where, as a result, the home of competitive gaming was born. Now, Blizzard is remastering StarCraft, bringing in up-to-date visuals and HD audio. If nothing else, Blizzard is now offering up the unpolished original for free—a chance to relive the classic, regardless of whether you've played it before or not.